Requires key to be in, to turn On, ensure key is captured. When in On position supplies power to control system. Notes: There is another Control Power key switch located in the Electrical Control room and wired in series with this key switch Both must be on to power the control system. When lit indicates that there is sufficient air pressure for operating the Braking System. Depress light to test lamp. When depressed will start the lift, If the Lift Start button at the rear of the Station is depressed simultaneously, and not blocked by the safety System. If the button is held down for an extended period of time, the Lift will stop. This protects against a short in the starting circuit. Light ON when Lift running. When depressed stops the lift. When lit indicates a train is occupying the Emergency Brake. Depress light to test lamp. When lit indicates a train is occupying Block A. (When train leaves station to top of lift). When lit indicates a train is occupying Block B. (When train leaves top of lift to after Ready Brake). When depressed stops Lift and Sets all brakes. When latched down light is ON. When depressed will silence the Chain Stop/Low Air alarm. Note: This does not correct the situation. l. A lift stop occus. 2. Air pressure for the braking system falls below a safe operating pressure. Indicates a malfunction in the Safety System, Gives an LED read out which corresponds to a specific limit switch, photo-cell. air pressure switch, etc. WLH Note: The LED display was covered over with blue plastic after the ride was converted to once person operation, no idea why. When depressed will reset the LED Display readout. This should not be reset until the problem is identified and rectified. When depressed UNLOCKS the electrically activated locking mechanisms on the lap bars on the trains. When depressed LOCKS the electrically activated locking mechanisms on the lap bars on the trains. Signals the operator that the train currently in the station should be dispatched. Signals the operator that he must dispatch immediately the train currently in the station, or possibly cause the train on the running track to be 'Set Up' when it enters the-emergency brakes. When the key is withdrawn in manual mode it allows the use of the transfer button located near the brake. Whenever this switch is turned shut down the lift and set all brake to be opened by the push to manual the Safety System will brakes. When in auto mode allows normal operation. The three sets of brakes (Emergency, Trim and Ready) remain set (closed) until the Release button for each brake is depressed. When depressed opens the Dispatch brakes. Operates when Braking switch in either mode (Manual and Auto). Light when lit indicates brake open. After train arrives at unloading/loading position in the station the Dispatch brake can not be opened until the second train has cleared Block A and is in Block B. 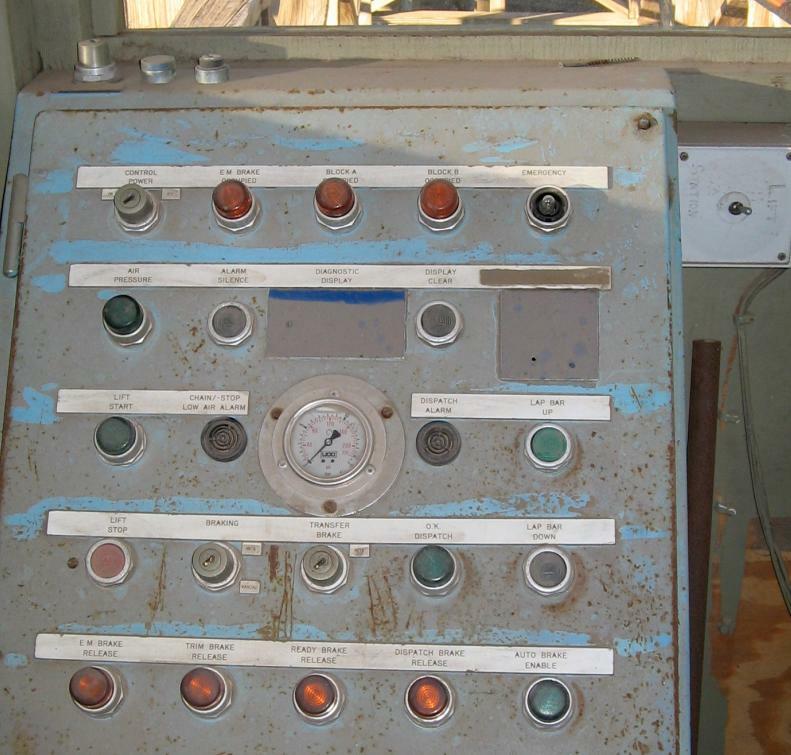 Indicator lights located under the following Brake Release push buttons. This light when lit indicates air in the dual pressure breaking system has been reduced to the lower (trim) pressure, on that brake. This gives smoother braking action during automatic speed reduction. The light out means braking pressure is at the high (maximum) pressure.